Home > Jewish Ethics and Learning > Mussar > The Reward of the Pure-hearted Brother! This is the moving story of a talented young Yeshiva student with good Midot, who did not find his soul mate for many years. The young man was over 28 years old, and he still had not met his other half. All his friends were already married with children while he was alone, without a wife. When his younger brother came of age to get married, he said to him, "I am asking you not to be afraid to go before me. I would not want you to delay getting married, even for a short time, because of me ... I bless you with all my heart that you merit building your own home quickly''. Soon after, that is what happened. The younger brother got engaged. During the whole engagement period, the older brother helped his younger one in the marriage process, without letting any sense of jealousy, competition, or other bad character traits that eat away at the man, get in the way. A year, then two years passed, and the young man turned 30 years old. There was no marriage proposal on the horizon and his heart was more broken than ever. One day he decided to call his younger brother because he had not spoken to him for several weeks. From the beginning of the conversation, when he asked him for news, his brother replied sadly, "G-d will help us, G-d will help us." It was not hard to detect that something was wrong. He tried to find out the source of his problem, and after much insistence, the younger brother finally confided to him: "We are in a delicate financial situation. Tomorrow is Erev Shabbat, and our house is totally empty. 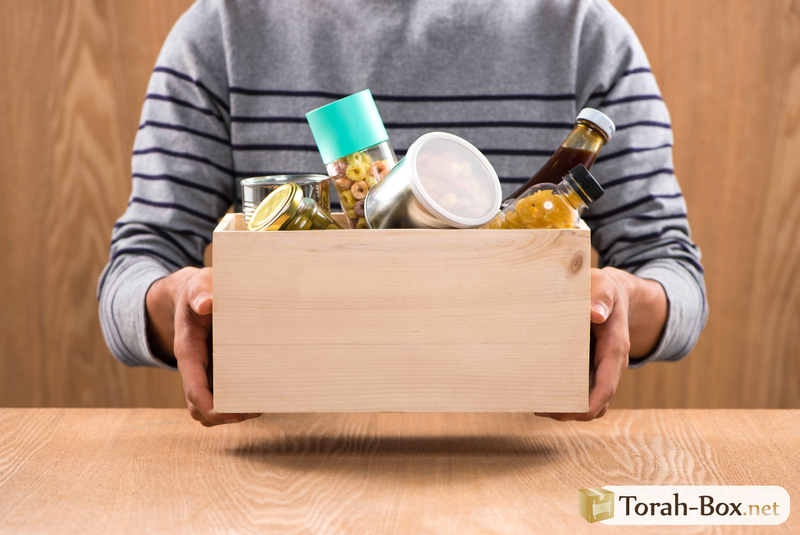 We have no means of buying food for Shabbat... "
The brother heard these words and his heart sank. He hastily hung up and left Bnei Brak in the direction of the southern town where his brother lived, taking with him several thousand shekalim from his savings (which were quite paltry). When he arrived in the city, he entered the local supermarket and filled several trolleys of food to stock his brother's home: fruits, vegetables, bread, drinks, meat and fish, dairy products, cleaning products, etc. The bill totaled 3000 shekalim, and our hero hurried to his brother's apartment. He knocked on the door, and the couple was shocked to see the many bags of food, filled with all kinds of good things, that would surely last a long time. The younger brother tried to refuse this generous gift, but his brother took him in his arms, hugged him and quickly left the scene, not without handing him an envelope containing 2000 shekel. The same evening, the younger brother's wife was invited to the wedding of one of her friends, but because of her sadness about the empty cupboards, she had told her husband that she would not go. But now the house was full, which improved her mood, and she decided to go to the wedding ... (The Gemara in Baba Batra's reports that there is a connection between meager subsistence at home and the wife's mood). The Chuppa ended, and the young woman decided to approach the girl: "I was next to you and I noticed that you did not stop crying. You are welcome to talk to me. Maybe I can help you? " "I have been searching for my Shidduch for a long time," the girl said, "I implored the Creator of the world at the time of the Chuppa to find me a good husband and to found a Torah home." After having taken some information on the girl, the young woman said to her: "I have an excellent suggestion for you. A young man with a pure heart and very fine qualities". She was, of course, referring to her brother-in-law! It turned out that the brother's extraordinary act of kindness convinced his sister-in-law to go to the wedding and to find there a broken-hearted girl who, at the same time, implored the Master of the world to find her a husband. The Creator of the world heard her supplication and had seen the devotion of the brother in the field of Tzedakah, and that same evening, the deliverance of the two young people took place and, ultimately, a new Jewish home was created! QUESTION: Why do some pure-hearted men stumble by sinning while some other, much less great people, are not trapped by the Yetzer Hara for such sins?